In late October 1947, more than 200 fires in southern and coastal Maine burned 205,678 acres, leveling nine towns and destroying more than 1,200 homes and seasonal cottages. It was the worst natural disaster in Maine history. At Bates, nearly 300 male students, about 40 percent of the student body of 767, volunteered for firefighting duty and were dispatched to various communities by a state disaster committee. “Since last Monday [Oct. 20], from 50 to 100 men have left Bates campus every day for various danger sections in the state,” The Bates Student reported on Oct. 29, including Kennebunk, Bowdoinham, Cornish, Kezar Falls, and Richmond. Meanwhile, female students conducted watches on campus and at Thorncrag, raked leaves away from residence halls, and collected clothing donations for the Red Cross. 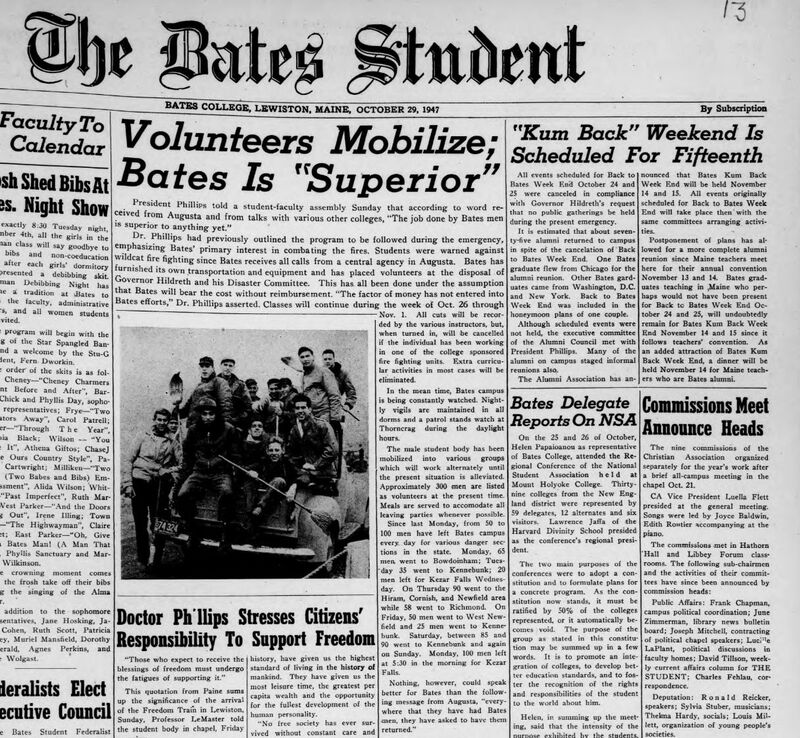 Volunteer firefighting by Bates students was “superior” said President Charles Phillips in a front page story in the Oct. 29, 1947, issue of The Bates Student. Here are three accounts of the Great Fires of 1947, two written contemporaneously and one looking back after 50-plus years. William Dill ’51 describes firefighting in Richmond in this edited excerpt from a letter to his parents back home in Edgeworth, Pa., dated Oct. 24, 1947. 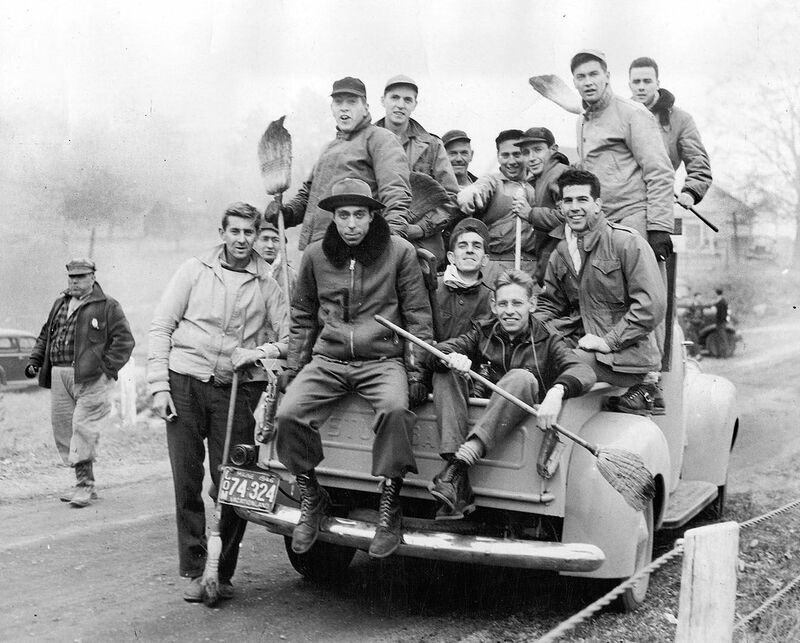 Robert Foster ’50 wrote a first-person account, “Volunteers fight forest blaze; Kennebunk crew is one of many,” for The Bates Student of Oct. 29, 1947. At one point during his firefighting, Foster looked up to see “a mile-long chain of flame [that] cast a cherry glow into the sky. The late Elizabeth Thomes Hobbs ’51 wrote a more lyrical remembrance of October 1947 a few years ago, recalling how she drew the dreaded pre-dawn fire watch.